I was never a huge fan of pot pies. Or so I thought! In the past, my only exerience with pot pie was those individual pies from the frozen section in the supermarket. Not a good experience, either. After that, the only other "pot pie" I've tasted is the kind prepared with condensed "cream of" soups and topped with biscuits. The experience with this one was better. While I liked the filling for the pot pie, I wasn't fond of the soggy biscuits. The tops of the biscuits always looked great, but the underside of the biscuits would be soggy. So, whenever I would make that dish, I would make the biscuits separately and serve on the side. Joe would usually split the rolls and put them on the bottom of his dish and top with the chicken/veggie mixture. After enjoying the pie crust bottom on the Loaded Mashed Potato Pie from a couple of weeks ago, I decided I wanted to attempt a homemade pot pie. No "cream of" soup and no canned biscuits. Like the Chicken 'n' Dumplings I made last month, I knew my friend Lisa often makes Chicken Pot Pie. I asked her if she had a tried and true recipe from her gluten eating days. She directed me to a recipe she has posted on her blog. A recipe she tells me she still makes using gluten free flours. Cook potatoes, onions and celery in a large pot of water, until potatoes are tender. Drain, set aside. Melt butter in a large pot. Add flour, milk and broth, stirring constantly until thick and bubbly. Stir in the salt, pepper, chicken and vegetables. Cook until heated through. Top with pie crust. Cut slits into the pastry to allow steam to escape. Bake in over for 25-40 minutes, or until pie crust is golden brown and filling is thick and bubbly. Remember I said I wasn't a fan of pot pies? Well, forget I ever said that! This pot-pie was amazing! We really enjoyed this dish! We each had a large portion for dinner. I had a smaller portion the next day for lunch and froze the rest for lunch later in the month. This recipe is a great way to use up leftovers making this a very frugal dinner! I used a simple Bisquick pie crust, the same crust I used for the Loaded Mashed Potato Pie. Super easy for this non-baker. 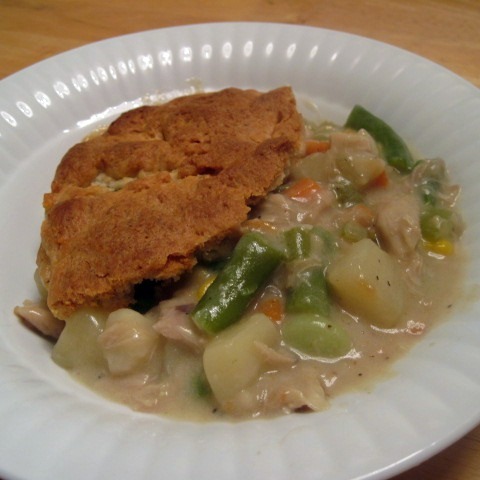 Rachel Ray had a Chicken pot pie turnover recipe a few years ago that we liked. It used pie crust cut in triangle with the chicken in the middle. I liked the chicken mixture to crust ratio better than the potpie recipes I've seen. You could make this with your Thanksgiving turkey leftovers. Budget friendly that way!! @Merry I'll have to check that out! Sounds yummy! @Colie's Kitchen That's the plan! :) I'm really looking forward to all of the meals I can make with the leftovers! I LOVE a good potpie! This looks great!